The picture to the left represents one of the simplest examples of universal design - an outlet at a reachable height that passes the "hammer test." If you look around the internet for advice on how high to place an outlet from the floor, you'll see several recommendations to use the traditional method - placing the outlet box one hammer's height from the floor. 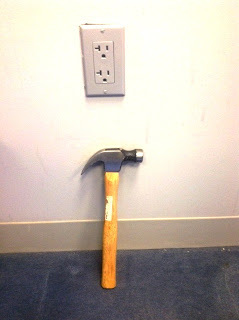 This outlet in my office is higher than my trusty hammer, making it easier to reach from a seated position. This simple step has made it easier to use for me, and if the next person to use this office uses a wheelchair, she would be able to reach it without much trouble. Similarly, light switches can be placed at a reachable height, doorways can be constructed with a 32" wide clear opening, bathrooms and kitchens can be built with enough space (60" diameter) to provide a turning radius for someone who would be in a wheelchair or use another device, and entrances can be built that don't require steps. Above are three categories that are used to increase the availability of these features: Mandates have been used in several states: for example, Vermont requires that homes that are "built without a known owner" have Visitability features in place - these are a subset of features that are designed to allow people to visit any home. In other places, this is only required of buildings built with government funding assistance - including subsidized housing, government loans, etc. Voluntary Incentives are the favorite of the building community, and are often easier to get into place. These vary from tax incentives for building homes with improved access to designation programs that put a "stamp of approval" on homes that meet a certain threshold. Receiving permits faster if your company builds homes with better design is an incentive that has little to no cost for governments, so it can be a cost-effective motivator. Information for consumers is a key component - In California, Assembly Bill 1400 required that "builders constructing new for-sale residential units to provide a 'checklist' of universal accessibility features to potential purchasers of a home." However, if consumers don't understand the options or the benefits, then they won't demand them in great numbers. 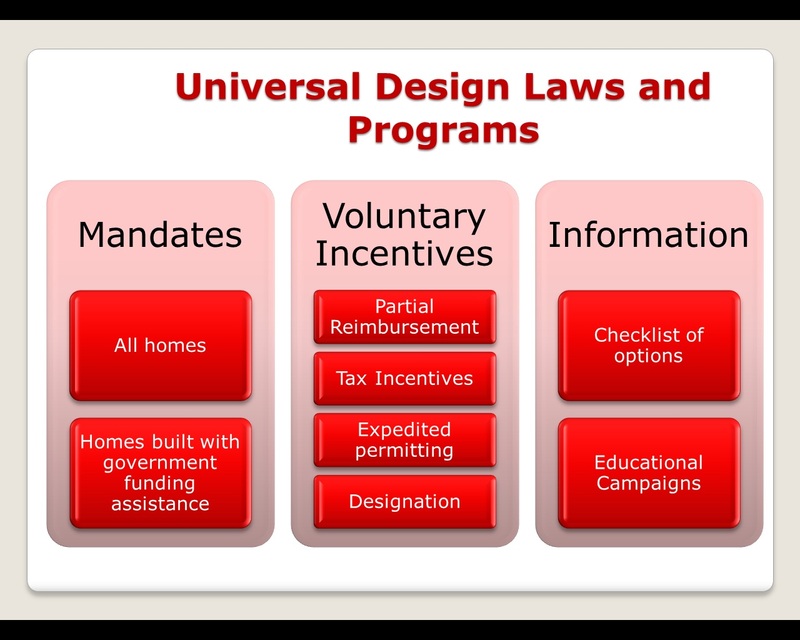 Educational campaigns and efforts from AARP and others help to educate consumers and opinion leaders about the benefits of designing housing that works for all. In our surveys, focus groups and other research, I've learned that many people (and policymakers) don't prepare for the possibility of developing physical difficulties unless they have one or live with someone that has one. Many homeowners seem to buy homes that fit their families at a certain time and then are forced to adapt to homes that don't work for them later. Universal Design and related concepts can provide homes that are better able to meet the needs of individuals and an aging society in the long run. For this reason, I hope that the attendees at #UDS5 had a successful event and are inspired to find new ways to make homes work better for all people. What do you think about universal design? Share by leaving a comment below or @DrUrbanPolicy.